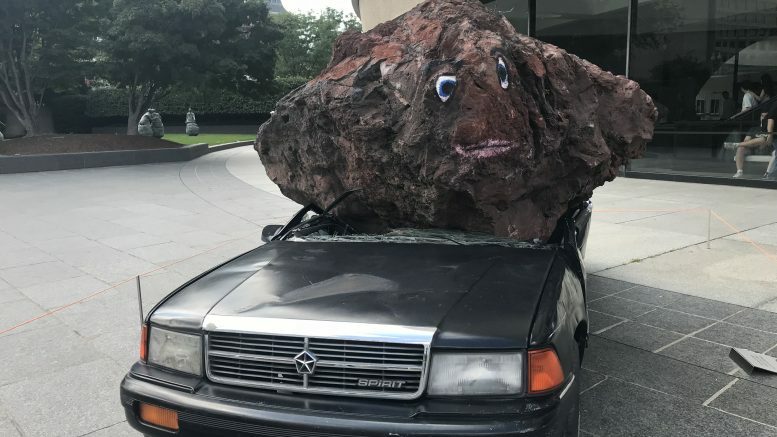 Sculpture by Jimmie Durham, titled ‘Still Life with Spirit and Xitle,’ made of car, volcanic stone and acrylic paint at the Hirshorn museum in Washington, DC. Fund managers remained bearish, with cash overweights at the highest level since January 2009, according to the Bank of America-Merrill Lynch fund manager survey for February. A net 44 percent of fund managers surveyed were overweight on cash in February, up 6 percentage points on-month, and well above the long-term historical average of 20 percent, the survey found. That came as 55 percent said they were now bearish on the outlook for both growth and inflation for the next 12 months, up 13 percentage points from January, it said. In addition, fund managers’ concerns over corporate leverage grew, with 51 percent saying their preferred use of corporate cash flow would be to improve balance sheets, the survey found. That marked the highest level since July 2009, during the Global Financial Crisis, it said. A net 46 percent of managers said corporate balance sheets were overleveraged, down just 2 percentage points on-month after touching a record high in December, it said. A record low of 10 percent said their preferred use of corporate cash flow was to return cash to shareholders, the survey found. But profit expectations improved slightly, with a net 42 percent saying they expected global profits would deteriorate over the next 12 months, up 10 percentage points on-month, although January’s level was the worst since December 2008, the survey found. Allocations to global equities fell 12 percentage points to just 6 percent overweight, the lowest since September 2016, despite markets’ rise since early January, the survey found. U.S. equities saw their allocation fall into negative territory, to 3 percent underweight, making it the second least favored region among fund managers, the survey found. But eurozone equities saw a big turnaround in allocations, rising 16 percentage points to a net 5 percent overweight, while emerging markets allocations were up 8 percentage points to 37 percent overweight, a sea change from September’s net 10 percent underweight, and making it a consensus overweight, BofA-ML said. Japanese equities also saw increased allocations, up 11 percentage points to a net 10 percent overweight, the survey found. Allocations to U.K. equities also rose, up 13 percentage points to a net 25 percent underweight, but the market remained a consensus underweight, which it has been since February 2016, the survey found. The global fund manager survey period was taken 1-7 February and had 173 participants, it said.